The Electronic Components are contained in a high quality ABS approved enclosure, which can withstand very low temperatures as well as the very high temperatures in the engine compartment. The Output Voltage on the anodes is stepped up to between 40 – 47 Volts DC, in comparison to the usual 12 Volts output from all other units on the market. The unit has reverse polarity protection against incorrect connection to the battery. A Metal Oxide Varistor is used to protect the unit from damage against lightening and transient spikes from the alternator and starter motor. Components from companies such as Phillips and Hewlett Packard are used to ensure a quality product, hence we offer a limited 10 YEAR WARRANTY on the electronics. The current drawn is between 10 – 35mA. RustStop will compliment any anti-rusting method already carried out on the vehicle such as rubberizing although it does entirely eliminate the necessity for this messy process. 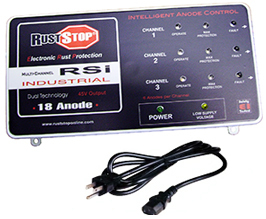 RustStop is safe and will not cause electrical shocks if a person touches the vehicle. Even when fitted incorrectly, RustStop could never accelerate rusting.